This three acres farm is named for the year Mooresville was incorporated, one year before Alabama became a state. Besides the happy sheep, goats, chickens, dogs and a pot bellied pig that live on this little farm, lavender and herbs are grown in an adjacent field for the goat’s milk bath tea, lavender soaking salts and bath truffles available for sale. You will enjoy reading about the featured 1818 farms animals on each hand crafted bath product. Other products from the farm include fresh eggs from pastured chickens, wool from Babydoll sheep, heirloom vegetables and cut flowers. 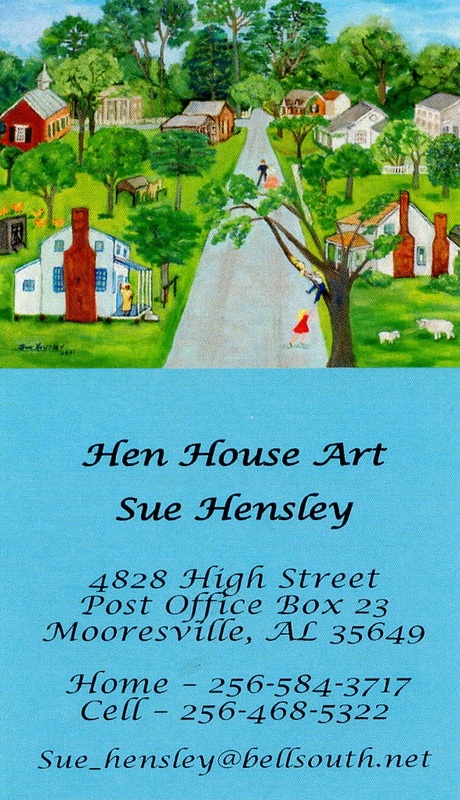 Sue Hensley has her studio in what was originally the office and apothecary of Dr. Cain, who bought the nearby home in the 1890′s. Sue does folk art paintings of Mooresville as it was many years ago when animals and fowl were common sights around town. She often adds current residents in old-fashioned garb to her paintings. JaVa.Mooresville is a coffee shop and gallery dedicated to providing excellent coffee, regional art and antiques, and an atmosphere conducive to the enjoyment of our historic community. Open Monday through Friday 7:00 a.m. to 2:00 p.m., Saturdays 8:00 a.m. ’till Noon. Welcome to a tiny cottage, boasting “all the sweet that’s fit to eat!” Open Thursday and Friday and for special town events, customers can try Lyla’s “homemade goodness” ranging from southern pralines, divine divinity, cheese straws and custard ice creams. The upstairs loft offers a unique space for eight to twelve lovely ladies to enjoy afternoon tea. Mooresville Mercantile, Purveyor of Fine Goods for the Traditional Home, features an unique selection of high-quality gifts and items for the home, primarily handcrafted and all Made in the USA. They also host classes, demonstrations and workshops on traditional and fun skills. Southern Carnage is a mobile bicycle repair service. With eleven years experience in bicycle repair, we have the knowledge and know-how to service or repair any bicycle, regardless of make or model. We have drop off service by appointment or we can come to you and repair it on site.